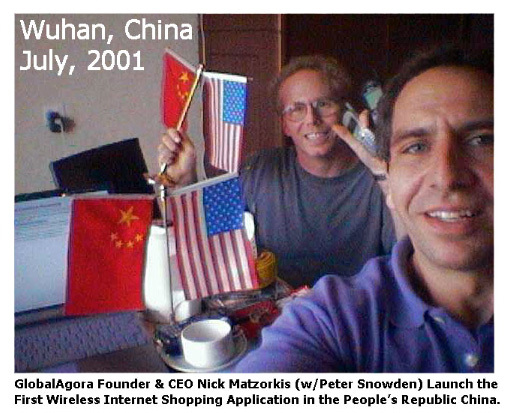 GlobalAgora CEO Nick Matzorkis (right) and Peter Snowden (left) celebrate on the day GlobalAgora-China successfully launched the first wireless Internet shopping application in China. 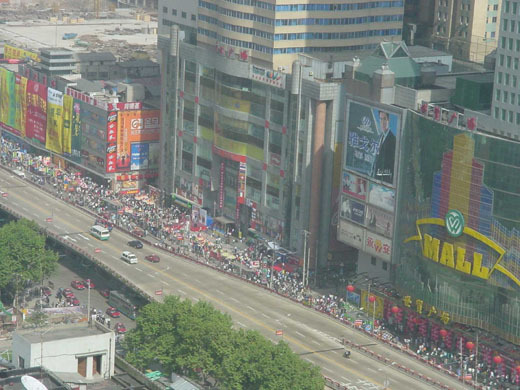 GlobalAgora servers were hosted on the China Telecom Internet backbone. China-U.S. cooperation flags were given as gifts from the management of Wuhan Department Store Group, the largest shopping mall chain in China. GlobalAgora came about as a partnership between Mr. Matzorkis, Nicholas Rockefeller, and the Chinese Central Government controlled, Wuhan Department Store Group.